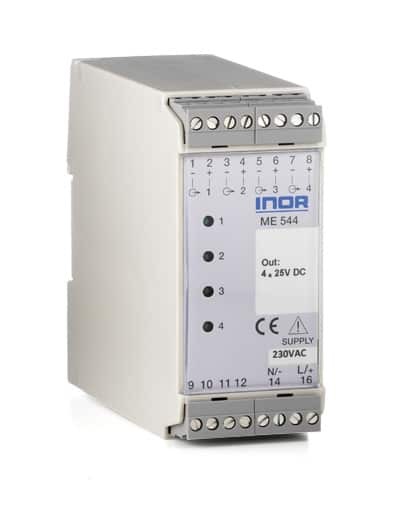 ME544 has four galvanically isolated supply channels for 2-wire transmitters. The output voltage for each channel is 25 VDC. Each channel is short-circuit protected and has a current limitation to protect measurement circuits from damage caused by short circuits or other faults. ME544 cuts the risk for measurement errors caused by earth potential differences with a number of 2-wire transmitters in the same measurement system. Maximum ripple 5 mV eff.